...... Have you ever dreamed that this is possible nowadays? 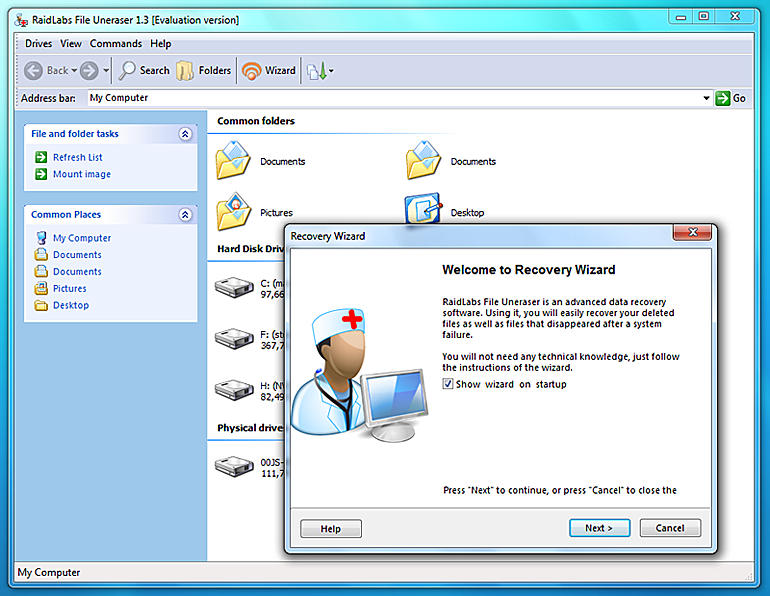 In addition the special skills are not required when you use the files recovery system; a trial version of the restore deleted files program is 100% free of charge. Restore deleted files from any storage device, including cameras, with this tool. FileAnt is a File Manager, an Ftp Client, Advanced tools, and file viewer. M-Files organizes documents to a single, easily accessible location. Easy to use interface to transfer files between your PC and mobile phone. FileMenu is a java component that provides the typical File Menu functionality. FileLink creates a second name for an existing file. The file will have 2 names. File Ace, the scriptable file and directory manipulator, simplifies file tasks. A COM object which enables a script to manipulate and resize image files. Qweas is providing links to File Uneraser 1.39.3 as a courtesy, and makes no representations regarding File Uneraser or any other applications or any information related thereto. Any questions, complaints or claims regarding this application File Uneraser 1.39.3 must be directed to the appropriate software vendor. You may click the publisher link of File Uneraser on the top of this page to get more details about the vendor.